I was recently filing images digitized from somewhat older slides and came across this upper tangent arc image from many years ago, in the early morning from here in Calgary. I decided to subject this image to some processing, in particular, embossing the image in Photoshop and low and behold, a faint Moilanen arc showed up, as you see in this composite image! I certainly do not live anywhere near to a ski slope or factory chimney that would produce lots of ice crystals. 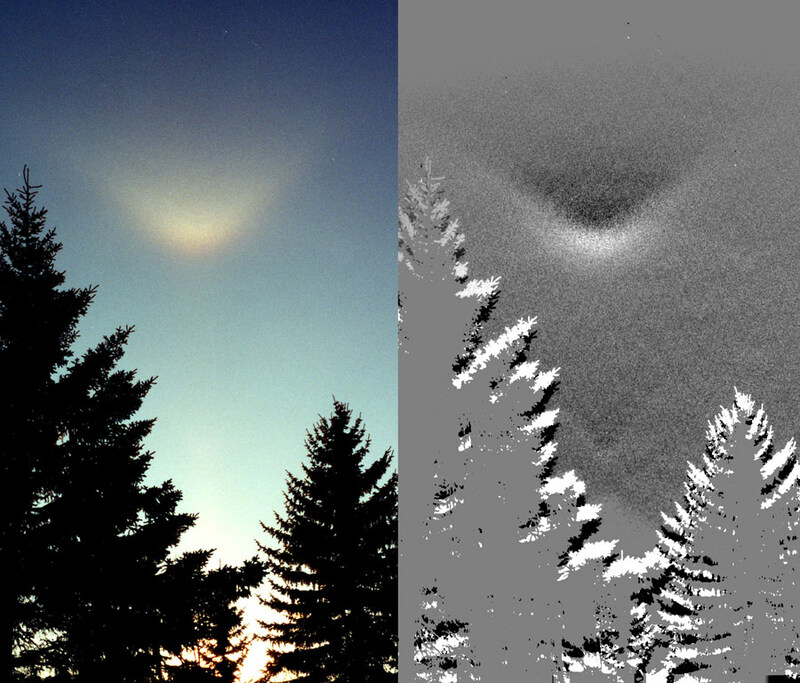 There is no evidence on the photo of local ice crystals as we see often in diamond-dust displays. The climate here is very dry and we often find low-lying layers of diamond dust particularly over our river. Thus, I hesitate to claim that this is a "natural" Moilanen arc but it was not taken near to ski slopes. Maybe our furnaces produce the requisite crystals sometimes, in which case I will be on the lookout next winter for a repeat of this display. I think I have seen a natural Moilanen arc. I was going outside to get in the car and there was a cirrostratus out so I looked up. There I saw a 22 degree halo and another halo out 10 degrees from the sun that looked like a white upper tangent arc when the sun is low. The sun was pretty high however, I think around 70 degrees. I also saw this in Florida, so there wouldn't be any snow or snowguns.